Those of us who are part of progressive spiritual groups and participate in interfaith activities often speak of the belief that all religions are here to serve the same purpose in different ways. Whether we are Jewish, Muslim, Christian, Hindu… aren’t we all searching for answers, working toward peace, and living our lives according to a structure that reminds us to connect to our communities and to our inner-worlds? I believe the answer is yes. “We have appointed a law and a practice for every one of you. Had God willed, He would have made you a single community, but He wanted to test you regarding what has come to you. So compete with each other in doing good. Every one of you will return to God and He will inform you regarding the things about which you differed.” (Surat al-Ma’ida, 48). But we can just as easily point out the opposite from each religion. The Israelites were not to adopt any rituals from their neighbors and in fact were to destroy their altars, pillars, and sacred trees. The Gospel of John has some not-very-nice things to say about Jews, and the Quron outlines some serious doom and gloom for non-believers. But I still hold on to my belief that all of our religions have been dancing with each other since humanity first asked the question, “Where did we come from?” I hold on to the idea that our goals are (or at least used to be) the same, and that we have learned and borrowed from each other since we first searched for a God. So it is really refreshing when we find those undeniable interconnections between religions or cultures. Think of the incredible similarities between the stories of Gilgamesh and Noah, or the many religions with creation stories that begin with the world being a dark, watery emptiness. Well, I may have a new one, and I learned all about it at… a Luau. “Ha” in Hawaiian means “the sacred breath of life.” When we think about common Hawaiian words, many include “ha.” Alo-ha, Ha-waii, O-ha-na, Ma-ha-lo. These words aren’t just about a greeting, a place, a family, and a thank you. They are infused with the idea that when we speak to one another, our sacred breath is acknowledging the sacred breath of the other. I find it interesting that in Judaism we have S-ha-lom which not only includes a “ha” but also closely matches the meaning of Aloha. Aloha is known as hello and goodbye, but it also means love, compassion, warmth, and friendliness (think of when people say “the spirit of Aloha”). Shalom similarly means hello and goodbye as well as peace (as any kid who had a Jewish education can tell you), but the root of Shalom, Shin-Lamed-Mem, means complete. Shalom is the completion of the soul… the way to peace. Doesn’t Shabbat Shalom mean a lot more than just a peaceful Shabbat? Two complex words at the center of Jewish and Hawaiian spirituality. Of course, we cannot discuss “ha” without talking about Avram. In the Torah, God gave Avram a “ha” and Sarai an “h” (hey) as well when God blessed them as God’s own and promised them they would be the parents of a peoplehood. Their names were affected by God, the sacred breath of life now infused in them. Maybe this is a stretch, but even just the word “ha” in Hebrew (which means “the” ) could have a spiritual connection. Everything definite has the letter hey in front of it. Each item, person, place, even adjective, with the “h” sound is as sure and true and real as our breath. Maybe not connected to Hawaiian language, but I like it anyway. I wish the Hebrew word for breath/spirit was Ru-cha instead of Ru-ach. If it was, I’d be doin’ a mic drop. Maybe it’s close enough that we have to flip the letter chet and the “ah” vowel so it at least looks like Ru-cha? Now, I don’t know if Hawaiian culture and Jewish culture ever danced around one another early enough to affect each other in these ways. It would be fascinating (for someone smarter than I am!) to find out if the trading and emigrating communities ever ended up in the same place at the same time. But even if they didn’t, I am going to add a little extra “ha” to my Hebrew and infuse the sound with my belief that we all share the same sacred breath of life. ha-olam omeid. The world stands. V’al g’milut chasidim And upon acts of loving kindness. These are stressful times. Whether you are fearful about the future or regretting the past, whether your stress stems from politics or health issues, whether your worries are about your parents, your children, yourselves, or the planet (or all of the above), it seems few of us are relaxed these days. We don’t know which way to go, which way to turn, what to fund, what to sign, whom to support, and whom to condemn. We are lost in a sea of news and social media, all while needing to keep up with the strains of every day life. No matter what we read on Facebook, Twitter or the New York Times, there are still sick children and parents. There are still groceries that need to be purchased, homework that needs to get done, bills that need to be paid, and career woes that need to get solved. Lately, it seems many of us wake up in the middle of the night finding we’ve been grinding our teeth and sweating through uncomfortable dreams as our subconscious works through its agitations. We find ourselves a little more testy, a little less patient, and a little less thoughtful. We feel afraid and alone. Upon three things the world stands. Upon torah, upon prayer, and upon acts of loving kindness. In some ways, this quote from Pirkei Avot is all we need to guide us. It won’t solve our problems, but it is a three-step road map to action and to inner-peace if we follow it, and for now, that will have to do. My old Rabbi and mentor used to talk about big T Torah and little t torah. Big T is for the text of the Torah scroll itself. Little t moves beyond those Five books of Moses to all forms of learning, teaching and study of wisdom, Jewish and otherwise. So, the world first stands upon knowledge: spiritual, scientific, social, political and personal wisdom. The world stands upon learning our personal truths and the truths of the universe. How does this relate to feeling stressed and out of control? Let’s all choose one element (I suggest just one to start when we are feeling like there are so many issues to face) of what is worrying us, and learn, study, and understand that issue. Let’s get the facts (oy, please let’s not be part of this “post-fact” world we keep hearing about! ), rather than rely on hearsay or headlines or word of mouth. Let’s gather truth, and whether these truths are about the world’s problems or about what a doctor or teacher may have reported about a loved one, let’s make sure we are as armed with wise, factual information as we can. That’s step one. Finally, we are told the world stands upon acts of loving kindness. G’milut is actually a giving, it’s charity. And chasidim? Boundless kindness and love. G’milut chasidim is giving away boundless kindness. Knowledge… Effort… Boundless kindness… Three simple Jewish ingredients for spiritually surviving trying times. This road map won’t solve everything, but we will be bathed in truth while marching toward resolution with grace in our hearts. Maybe that is enough for us to gain control over what appears to be out of control. So, the next time we feel ourselves spinning, let’s remember this post. Let’s learn, act, and do our best to offer boundless kindness as we take it one step at a time, one day at a time. 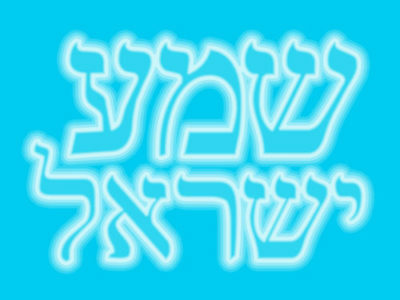 Another musical gift for all of you… Shema as we sing it at Cool Shul. Kol Nidre and Yom Kippur day.